Editor's note: This release was updated April 12, 2018 to reflect speakers at the School of Professional and Continuing Studies graduation ceremony. 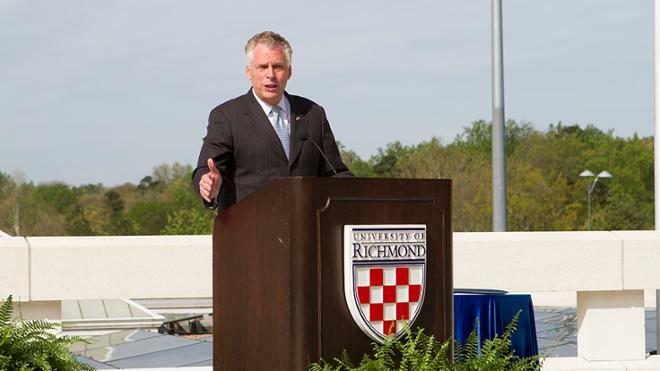 Former Virginia Governor Terry McAuliffe will deliver the main commencement speech during the ceremony May 13 at 2 p.m.
Ting Xu, founder of Evergreen Enterprises, will deliver the commencement address for the MBA ceremony. Doris H. Causey, managing attorney of the Central Virginia Legal Aid Society’s Richmond office will address graduates of the Richmond School of Law. Main Commencement, May 13, 2 p.m.
Terry McAuliffe served as the 72nd Governor of Virginia from 2014 to 2018. As, Governor, McAuliffe focused on equality for all Virginians, enhancing quality of life, and fostering economic development and a new diversified economy. During his tenure, he brought the unemployment rate from 5.4 percent to 3.6 percent. President Barack Obama appointed McAuliffe to the National Governors Association’s Council of Governors to provide advice on national security matters. McAuliffe is now State Engagement Chair of the National Democratic Redistricting Committee. He was chairman of the Democratic National Committee from 2001 to 2005, co-chaired President Bill Clinton's 1996 campaign for reelection and 1997 Inauguration, and was chairman of Hillary Clinton's 2008 Presidential campaign and the 2000 Democratic Convention. MBA Commencement, May 12, 11:30 a.m.
Ting Xu, a Shanghai native, founded Evergreen Enterprises in her Richmond suburban home in 1993 with $20,000. From a small decorative flag line, Evergreen has grown to be one of the leading gift, garden and home decor companies in North America, with more than 1,400 employees. Under her leadership, the company has completed numerous successful acquisitions including the 2010 purchase of Plow & Hearth. She is a member of the Robins School of Business Executive Advisory Council. She also is an advocate for Chinese-American relations, sponsoring events like the VMFA's Forbidden City and Terracotta Warriors and the Richmond Ballet's Road to China. School of Law Commencement, May 12, 2 p.m.
Doris H. Causey, who serves as the president of the Virginia State Bar for the 2017-18 term, is managing attorney of the Richmond office of the Central Virginia Legal Aid Society, a non-profit law firm that provides free legal assistance to low income people in civil cases and preventive legal education. She also serves on the Old Dominion Bar’s Executive Committee. She is a Virginia Bar Association Fellow, a member of the Richmond Bar Association and a past member of the Bench Bar Conference. Her practice focuses on civil litigation, family law, landlord tenant, foreclosure defense and poverty law. School of Professional and Continuing Studies Commencement, May 12, 9 a.m.
Crawford is a Master of NonProfit Studies student and the director of Virginia Interfaith Power & Light, an organization that works with faith communities and people of all faiths to ensure healthy communities and environmental justice through education and advocacy. Reed, who received his undergraduate degree from SPCS in 2013, is a 33-year veteran of the hospitality industry and currently serves as vice president at SMI Hotel Group, overseeing sales and operations of the company’s six hotels which are located in Virginia and Texas. He is the recipient of the Gibb Family Distinguished Alumni Award, which recognizes the accomplishments of an SPCS alumni member as well as their support of SPCS. Roberts is an associate adjunct professor of Education and an avid lifelong learner, having earned his master’s degree and law degree as a nontraditional student. Roberts has served in numerous educational law positions throughout his career and currently serves as the School Board Attorney for Chesterfield County Public Schools. He is the recipient of the Itzkowitz Family Distinguished Adjunct Faculty Award, which is selected by the SPCS student body and recognizes the teaching achievements of an adjunct faculty member.